When you have to book in advance and work with ambient light you're at the mercy of the elements. Fortunately Spain is a lovely sunny country so chances are the light will be good, but it's always worth thinking about the best time of year to photograph a particular tourist attraction. In the opening shot of the video you see the Court of the Myrtles. Typically this scene is shot vertically and includes a water feature in the foreground. I went for something different that worked with the hard angled light and reflections. It just needed something more. Then I saw the lady wearing red wandering around on the other side of the pool. I had to wait for several minutes before she walked into the perfect spot to create that extra focal point that completed the image for me. It's small elements like this that give an image that extra kick they need to lift them above the ordinary. You have to constantly ask yourself, "How can I make this image better by using what's available in the scene?" 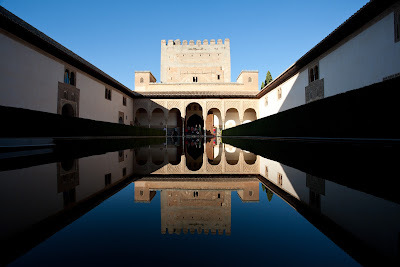 On this last point my thoughts were that the essence of the Alhambra is the craftsmanship and and attention to detail in every element, but the really amazing thing is the sheer quantity of detailed work, and that's what I tried to show in several of my images. There's just so much going on in every room in the palace it is breath taking. Hope you found this insight useful.